Home Agile Is sprint goal same as business objective? Sprint Goal is not one of the 11 essentials. Even though it is not one of the 11 essentials, we the trainers emphasize on it’s importance. 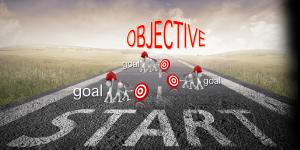 Use of the words like objective and goal in the same go. Not enough information on the sprint goal itself in the Scrum guide. One of the most common question that I usually encounter is – Whether the sprint goal is different from business objective? This is the question which I will try to explore in this post. During Sprint Planning the Scrum Team also crafts a Sprint Goal. The Sprint Goal is an objective that will be met within the Sprint through the implementation of the Product Backlog. Now, in the first reference we come across that there is an Objective which is presented and a Sprint Goal is crafted. In the second reference, it is said that Sprint Goal itself is an Objective. Reading these two references consecutively do create a sense of confusion. So are they same or are they different? Objective (noun): Aim, Intention, Purpose. Goal (noun): Aim, Intention, Purpose. Voila! both mean the same; so essentially both should be same, then what is the confusion. Well the confusion starts within the references. The Sprint Planning event starts when the PO presents an Objective for the sprint (remember this is not the Sprint Goal) and during the Sprint Planning event the Scrum Team crafts the Sprint Goal. And here is where we need to understand the difference between the two. Allow me to present an analogy; you decide to take a vacation. When you decide so; is it fully formulated i.e. do you know where you will go for vacation, what you will do, where would you stay. I believe not everything is formulated. It is initially pretty vague and is basically what Gunther Verheyen terms as a desirement. Now you take this desirement to your family/friends just as the PO takes the objective to the rest of the Scrum Team. Then you, your family/friends have a discussion about the vacation, contemplate on where to go, what to do, when would you say the vacation was successful and so on and arrive on how your vacation would look like. Similarly, the Scrum Team collaborates and discusses about the desirement presented by the PO and arrives at Sprint Goal achieving which, will deliver the Objective. In essence (but not necessarily) an Objective might be little vague but Sprint Goal needs to be SMART i.e. specific, measurable, attainable, relevant and time-bound. Business Objective: I want payment gateway enabled on my e-commerce application. Should we do Credit Card/Debit Card enablement? Are we considering e-Wallets as well? Can a development team working in iterations of week or two do all of it at once? May be, may be not. So the Scrum Team collaborates on identifying what can be done within the time-bound of the sprint that would help attain the Business Objective. Once the team forecasts what they can do, they craft the Sprint Goal. Enable payment via Credit Cards so that customers can place order on the website. Accept Cash on Delivery orders on the e-commerce application. Allow customers to place order on the e-commerce application using paypal. At the start a business objective may be a vague idea or desire of the customer, however it needs to be translated into a Sprint Goal which is SMART. Footnote: Having said that, I would also like to share that in my experience I have seen business objectives so well drafted that they themselves become sprint goals for the Scrum Team. agile, SAFe, scrum, sprint goal. Bookmark.